The Hotel Californian debuted on lower State Street in fall 2017 to much fanfare. While its eye-pleasing exteriors are architecturally compatible with the Spanish Revival, for which Santa Barbara is known, the interiors offer something a bit different — tile work and a color scheme inspired by the bright blues found in Moorish cities, such as Marrakesh, Morocco. The two styles are fused well, thanks to the artistic sensibilities of top interior designer Martyn Lawrence Bullard. 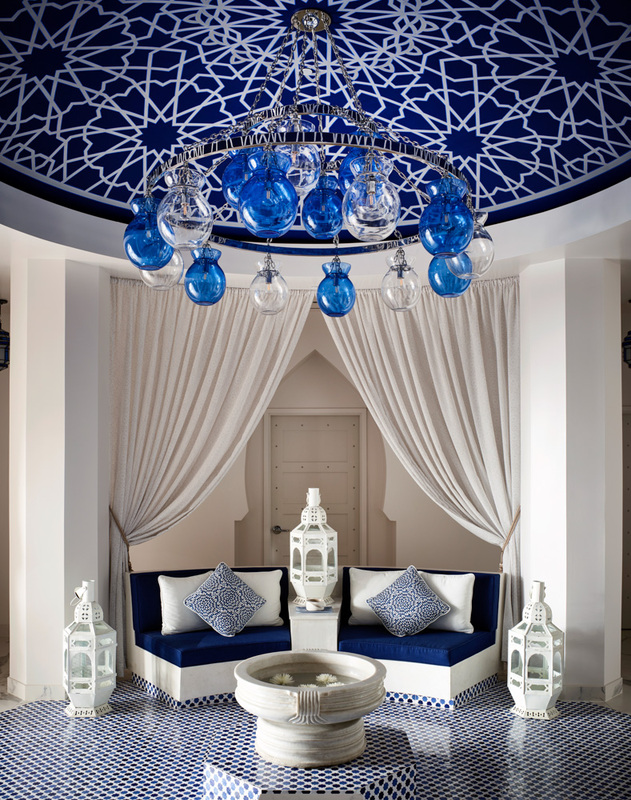 The design is particularly dazzling in the hotel’s spa, the Majorelle, where vibrant blue accent tones bounce off pristine white walls like reflections from an azure Mediterranean Sea. It’s an intimate space comprising four treatment rooms, men’s and women’s steam rooms/changing areas, and a courtyard ringing a circular-columned waiting area. The spa has an appetizing menu including aromatherapy, skincare treatments, couples packages, and massages. I recently visited Majorelle and opted for the Relieve Muscle Aches and Pains signature experience — it was in all honesty the best massage I’ve ever had. My masseur, Anders, dug deep into my knotty muscles, breaking up fascia and relieving tight and sore tissue. After the 90-minute session, I emerged in a delightful fog of tranquility. 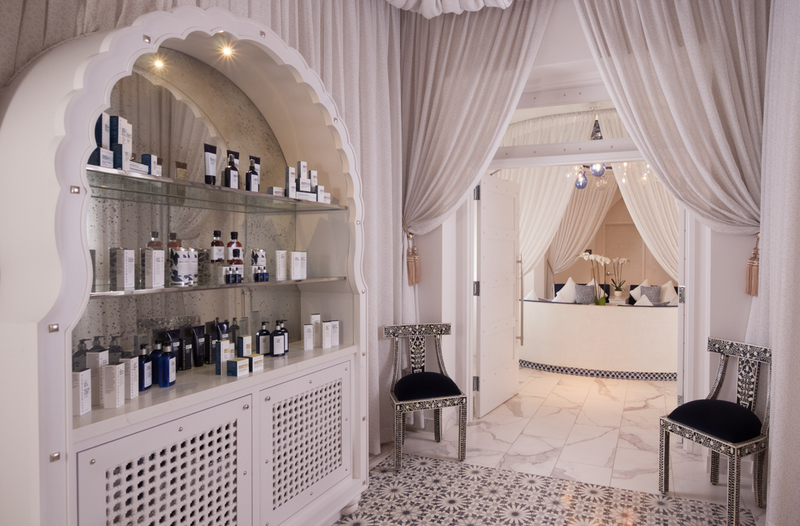 A few days later, I spoke with Majorelle’s director, Emma Spencer, to learn about how this lovely spa came to be. What is your background? I’ve been in the industry for twenty-something years. I was an esthetician and massage therapist, and then I kind of worked my way up the ranks, leaving England, moving to Bermuda, working there for seven years … for Fairmont Hotels and Resorts. I launched their company called Willow Stream Spas. We had a hurricane in Bermuda, which took me to the Fairmont Sonoma Mission Inn, which is in Northern California. I went there as the treatment manager and was there for quite a few years. … In 2009, I quit my job, and I traveled and ended up in Santa Barbara. … I was employed last year while it was still under construction. Curating the menu based on that Moroccan Californian vibe, I knew we couldn’t pull in the whole the wet areas of that Moroccan influence, like the hammams and the pools. So, what I created was the customization of the treatments, a menu designed for the individual, and little beautiful amenities in the locker room. … Essential luxury, which is our theme — essential luxury along the path to be well. How many therapists do you have? In total, we have 15. And that’s including estheticians. … I wanted a core team, because, energetically, I wanted to create a space that was safe and that was welcoming, and I was willing to take that extra step to get the right therapist for it. We have this beautiful, cultural sense here and we’ve been able to create that environment. I’ve worked in spas all my life, and I’ve worked with over 150 staff, and this is important to have a core group. I’m very proud of my team and we’re a little family. What products does Majorelle use? We carry a lot of the Moroccan argan oils in our products. All of our products are natural and organic. … I’ve brought in Margaret Dabbs London, which has all those natural ingredients in it. … Naturopathic was chosen before I came. … It is our signature line. …We also carry Body Bliss, which is a beautiful aromatherapy line. Is the spa meant mainly for hotel guests, or are you wanting to expand to the community at large? I want the community. That is my goal for this next year. It’s been really fun these past six to eight months, because when I look at the statistics, it’s been 50/50…but my goal is for it to be a space where locals can come. We do offer the local’s rate that works out to be a 20 percent discount. And we are going to be offering different locals packages. … We have a 30-minute facial we’re adding called Glow and Go. … And then we’re also going to do a 30-minute massage. We’re noticing the locals enjoy the hours, but they’re like, “Can I just pop in on my lunch break?” So I’m creating the ability for them to do that. … My goal is to introduce more yoga classes, too, because we have a beautiful outdoor space. … And the price of those will be a lot lower than if they were to go to a studio. How do you make yourself stand out? One, it’s the menu. Two is the therapists. [Also] we’re right downtown. It’s really easy to get here. … It’s very convenient. And of course, once they’re in here, it’s very intimate. A group of friends can come and they can enjoy an afternoon in the spa and it will just be them. It doesn’t feel like they’re cattle. … Another thing that’s very different with us is we offer 60-minute treatments. We don’t shrink it down to 50 minutes. You don’t feel rushed, and the therapists don’t feel rushed. … And then, we offer goat yoga once a month. Tell me about some of your treatments. We have our signature treatments; the Couture, which is either three or four hours, is a true made-to-measure experience. It starts with a preliminary consultation with our therapist. Once they understand your needs, then they curate the treatment based on whether you want three hours or four hours — it could be anything from a simple pedicure to a tarot card reading, or a psychic-energy clearing, or a chakra balancing, or a deep-tissue massage. It could also mean crude shiatsu massage or reflexology. We do intuitive reading, which is about connecting to that deep intelligence of your body. Our therapists use refined sensory tools which help to enhance the energy work. The deep mediation and what we do with that is you release old patterns to help to balance out the center of your body. We might do past-life regression, we might include energy work with reiki … [or a] deep, grounding massage with aromatherapy. Again, the aromatherapy is selected for that individual on that day, in that moment. 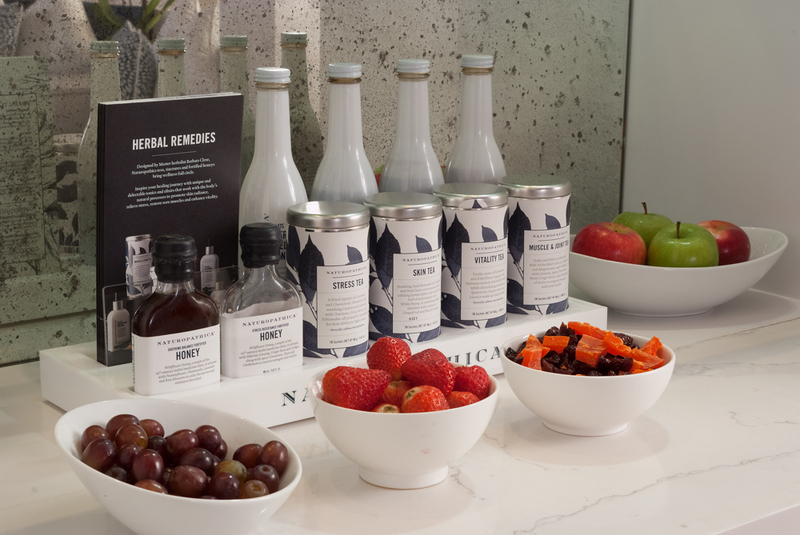 And whatever product we create for them, the infused aromatherapy, you get to take that home with you at the end of your treatment, which is really special. Call 882-0103 or see thehotelcalifornian.com/santa_barbara_spa.